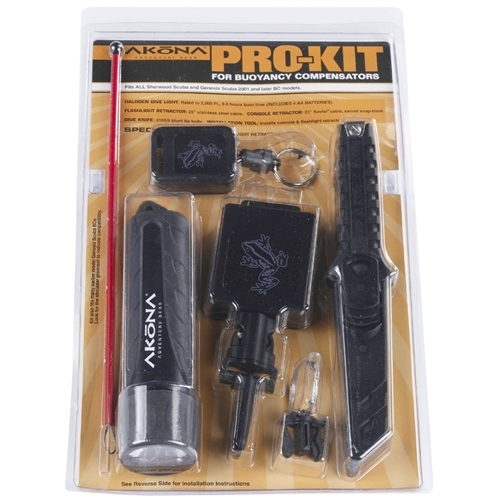 Have a question about the Akona BCD Pro Accessory Kit? Add all the features you want to your BC. Having the right accessories on a dive can make the difference between having fun and just not getting the most out of your diving experience. Having to clutch your gauge every time you fin over a reef fearing you may cause damage to the environment due to a dangling console or wanting to look under a ledge, but you don't have a handy light to see well are just a couple of things that can create a less then optimum experience. So now when you're fining over the reef your console is retracted up snug to your gear, yet with one pull of the cable the instruments are easy to read. When finished monitoring your instruments they automatically retract to their snug up position out of the way. You also have a handy light with you with the same unique retractor feature plus much more! Kit includes: Side-Kick 316 stainless steel knife with 3.5" blunt blade, Gauge Console Retractor with 21" durable Kevlar cable swivel snap hook and optional stainless steel key ring clip, Light retractor with 25" stainless steel cable and key ring clip, Tec 40 Halogen dive light that is rated to 2,000' and has a 3 to 5 hour burn time, Free 4 AA Alkaline Batteries and installation tool Included! I love this package because for $100 I get a dive knife, light and two retractors that are built into my BCD. This is well worth over $160 if I bought it separately. I appreciate the fact that Genesis and Sherwood took the time to build this into the BCD itself. Everything I need is right there so I don't have to fumble in my dive bag for it. I highly recommend this and if you have the money buy the LED light. on 8/24/2012 Is this knife sharp-tip or blunt-tip ?